So it seems that the powers that be got wind of our upcoming campaign and granted Warwick its very own nuclear winter. For anybody who was on campus on Friday and needed to get back to Leamington or Coventry, well, it was a hard task… but anyway, it’s a new week and with that Warwick Labour has another full schedule! Lefty Lattes: Week 3 – Feminism: Fit for the 21st Century? For this week’s Lefty Lattes, we’re going to be discussing feminism! Parliament’s composition is over 75% male and, even through the use all-women short-lists and other techniques to encourage participation, politics is still largely, unfortunately, a male-dominated arena. So is feminism needed now more than ever? Or is the feminist movement now outdated and irrelevant to the 21st century? What role should feminism play in an upcoming Labour government? And why are so many men and women scared to associate themselves with feminism and what can be done to change these attitudes? The usual meeting place of 5pm on the Piazza stands, then we shall move up to either the Terrace Bar or the Mighty Duck depending on numbers/availability. This Friday we’re conducting one of our largest campaigns to date. The world possesses enough nuclear weapons to destroy itself many times over. The UK alone will spend more than £80 billion replacing the Trident missile system. Terrorist groups and rogue nations are fast acquiring nuclear capabilities. In every aspect of human life, we learn from our mistakes – but with nuclear weapons, we may never get the chance. 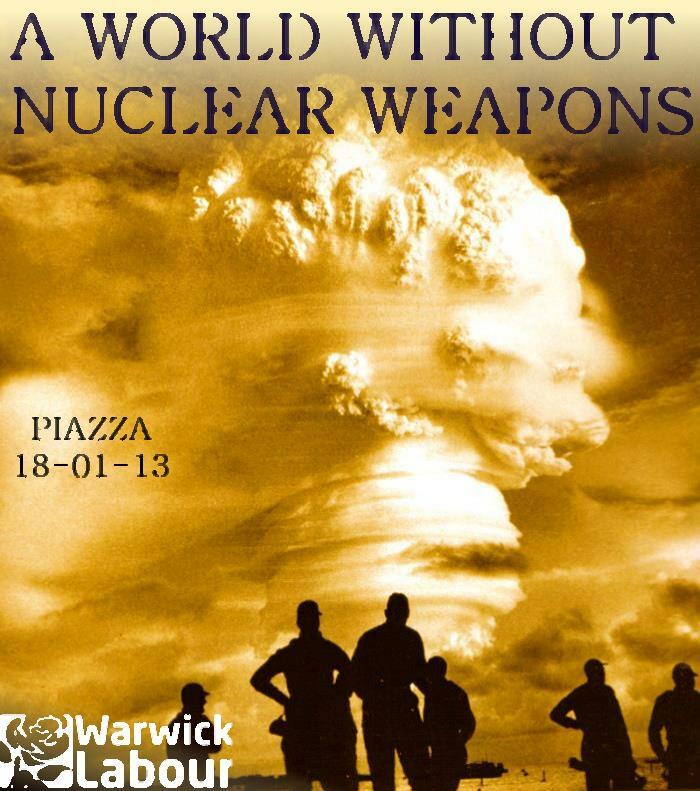 This Friday, join us on the Piazza to campaign for A WORLD WITHOUT NUCLEAR WEAPONS! We will be gathering signatures, handprints, artwork and anything else you guys come up with on our very own 6 foot model nuclear bomb, to express Warwick’s solidarity against the most destructive force in the world. We’ll also be running a traditional petition to send to the Labour Defence review to make sure our voice is heard. Nuclear Weapons have the ability to devastate billions of lives, yet it’s almost a forgotten issue. Come out on Friday and help change this! Following the campaign, on Friday evening we’re hosting a film screening of the excellent 2010 Lucy Walker documentary, “Countdown to Zero”. The film has been called one of the “greatest horror stories ever told” and accurately depicts why we desperately need to get rid of the world’s nuclear weapons. Reuters has said the film was “convincingly argued and extremely polished”, claiming that it was “absolutely chilling”. The Observer has named it as one of the “five films to watch” at that year’s Cannes Festival, while The Guardian has called it “unmissable”. Whether it be by terrorists and rogue nations, or by pure accident, the threat from nuclear weapons is still has high as it ever was before. Whatever your political views, this is a film every person should see. Come along Friday evening at 7:30pm in MR6 (Meeting Room 6) in SUHQ for the screening. If you can’t find us, then give me (Tom) a call on 07554344657. Following the film we’ll no doubt retire to the Terrace Bar to chat about the campaign, the film and where we go from here. Hope you all have a great week, and see you at one of our events soon! Previous Warwick Labour Goes To “Skool Dayz”!